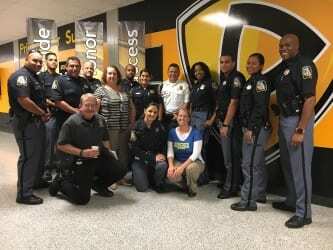 Officials from Baltimore County Public Schools (BCPS) and the Parkville Precinct of the Baltimore County Police Department recently teamed up for student outreach at Parkville High School. Recently, representatives of the BCPS Department of School Safety met with school officials, BCPS ESOL (English for Speakers of Other Languages) representatives, an Assistant Superintendent, and Parkville Precinct supervisors to discuss strategies on how to engage students from different cultural backgrounds whose primary language is not English. Officer Buie, the School Resource Officer for Parkville High School, worked tirelessly to set up an event. She contacted officers from around the Baltimore County Police Department who were from different countries and spoke Spanish. Those officers were happy to assist. With the help of school administration and police officials, a Multicultural Assembly was held where those Spanish speaking officers met with groups of ESOL students. The focus of the meetings was to discuss career advancement, the value of a good education, law enforcement, family values, and success. Students were given an opportunity to ask questions and engage in a meaningful conversation. Officer Carlos Selvi, the Cultural Liaison Officer for the Baltimore County Police Department attended the event. He spoke about his experiences and making the right choices in life. He said the police in some of the countries these kids come from are very corrupt and “we need to show these kids we are not the bad guys”. The event was very successful and officials are considering having a similar event in the future.